Turkey on Thursday welcomed the United Nations General Assembly's clear-cut rejection of a United States decision on Jerusalem's status, and conveyed its expectations for U.S. President Donald Trump's administration to rescind its "unfortunate decision" without delay. In a series of tweets on Twitter, President Recep Tayyip Erdoğan said he welcomed the "overwhelming support" for the resolution in the U.N. General Assembly, where more than 100 countries voted in favor of calling for the United States to reverse its decision. 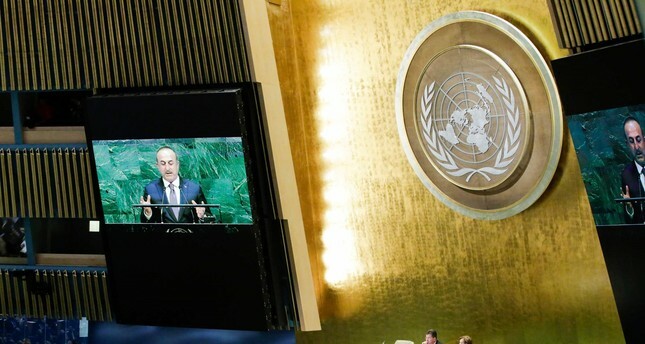 "We expect the Trump administration to rescind without further delay its unfortunate decision, whose illegality has been clearly established by the UNGA," he wrote. We welcome with great pleasure the UN General Assembly's overwhelming support for a historic resolution on Al-Quds Al-Sharif. We expect the Trump administration to rescind without further delay its unfortunate decision, whose illegality has been clearly established by UNGA. Erdoğan added: "On behalf of myself and the Turkish people, I extend my gratitude to everyone who has been supportive of the cause of Palestine and Al-Quds Al-Sharif. Presidential spokesman Ibrahim Kalın also expressed his approval for the UN General Assembly's rejection of the U.S. decision via tweet. Calling the U.N. vote "historic" for Jerusalem, Palestine and international justice, Kalın said he hoped the resolution would be beneficial for the whole world. The U.N. on Thursday overwhelmingly adopted a resolution on Jerusalem, calling on the U.S. to withdraw its recognition of the city as Israel's capital. Deputy Prime Minister Bekir Bozdağ also praised the vote for "ignoring the U.S. decision." The 128 countries "showed that they, as sovereign and independent countries, do not surrender to the clear threat and oppression of the U.S.," he tweeted. This U.N. rejection of the U.S. decision also "showed that Palestinians and Jerusalem are not alone," he wrote. Unlike the U.N.'s 15-member Security Council, the U.S. does not have a veto in the General Assembly. The U.S. on Monday stood as the only country to veto the U.N. Security Council resolution that rejected the establishment of diplomatic facilities in the contested city of Jerusalem. However, unlike in the Security Council, General Assembly resolutions are non-binding. "Although it is non-binding, it will be very effective as it defines legitimacy against threat and blackmailing," Turkey's EU Minister Ömer Çelik tweeted. He described the U.N. decision as "a turning point". "It is such a happy and historic day for Jerusalem, a day when all who defend legitimacy won," he added. International law views the West Bank -- including East Jerusalem -- as "occupied territory" and considers all Jewish settlement building on the land to be illegal. Jerusalem remains at the heart of the Middle East conflict, with Palestinians hoping that East Jerusalem might eventually serve as the capital of an independent state of Palestine.